Trade Mark. 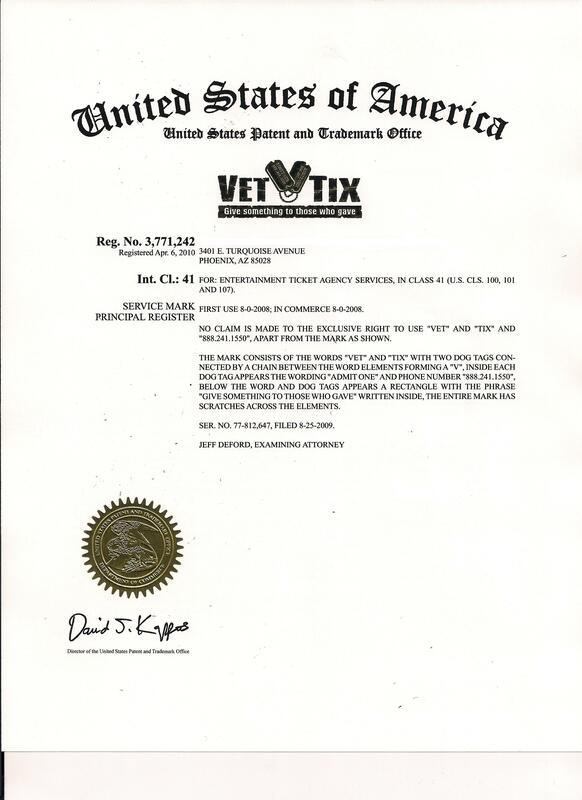 Vet Tix is a registered trademark of The Veteran Tickets Foundation. The VetTix (Reg No. 3,771,242), and Veteran Tickets Foundation (Reg No. 3,771,380) logos are trademarks of Veteran Tickets Foundation. The Trade Marks belong to Veteran Tickets Foundation and may not be used, reproduced or disclosed without the written approval of the Veteran Tickets Foundation. Logos (banners) may be used on websites as long as a link back to VetTix.org is provided. Permitted Use. You agree that you are only authorized to visit, view and to retain a copy of pages of this Site for your own personal use, and that you shall not duplicate, download, publish, modify or otherwise distribute the material on this Site for any purpose other than to review event and promotional information, for personal use, or to purchase tickets or merchandise for your personal use, unless otherwise specifically authorized by Veteran Tickets Foundation to do so. The content and software on this Site is the property of Veteran Tickets Foundation and/or its suppliers and is protected by U.S. and international copyright laws. d) to publicize, now or in the future, the names of the participants including information regarding them, their physical or emotional conditions and the details of any Hero's Wish or Tickets for Troops granted. 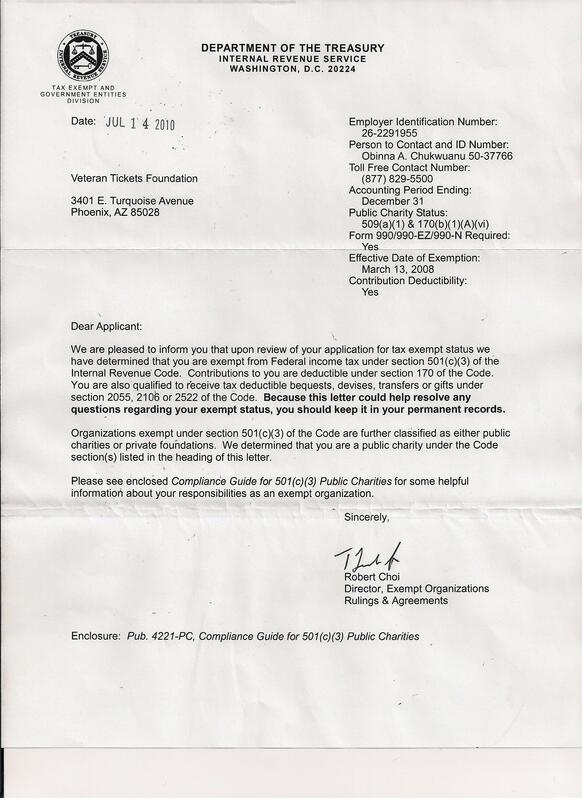 The Recipient and each of the participants agrees that it is not necessary for VTF or anyone else to contact them prior to releasing any information authorized by this document. Each of the participants hereby releases Veteran Tickets Foundation from all liability, damages, or claims of any kind resulting in or from, or arising from the use, distribution or disclosure of any photographs videotapes, electronic recording or other information regarding Participants and the Wish or Request. If your Wish or Tickets for Troops Request is accepted, Veteran Tickets Foundation would like your permission to use your story and your photo in one or more of the media releases. By agreeing to allow the use of your likeness and story, you will be helping to raise awareness and donations for your Wish and the Wishes of others. Veteran Tickets Foundation respects the privacy of each individual and will only discuss your story as needed in order to promote the mission of the Hero's Wish Program - Powered by Veteran Tickets Foundation and Tickets for Troops Program. External Links. The Site may automatically produce search results that reference or link to third party sites throughout the World Wide Web. Veteran Tickets Foundation has no control over these sites or the content within them. Veteran Tickets Foundation cannot guarantee, represent or warrant that the content contained in the sites is accurate, legal and/or inoffensive. Veteran Tickets Foundation does not endorse the content of any third party site, nor do we warrant that they will not contain viruses or otherwise impact your computer. 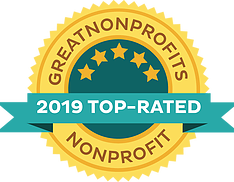 By using the Site to search for or link to another site, you agree and understand that you may not make any claim against Veteran Tickets Foundation for any damages or losses, whatsoever, resulting from your use of the Site to obtain search results or to link to another site. If you have a problem with a link from the Site, please notify us by visiting our contact page and we will investigate your claim and take any actions we deem appropriate in our sole discretion. While we thought the above paragraph covered everything concerning links, we have been asked numerous times about a few specific links that we have on our site, so below is a more detailed description of our relationship with some of those links. If a link not mentioned below is in question, please refer to the above paragraph. Discounts and Coupons: ALL Web Sites, Teams, Venues, Theme Parks, Restaurants, etc are owned by separate corporations. Veteran Tickets Foundation is listing these companies discount codes as a cost savings benefit to users of our website that have had their military service verified through our system. Each ticket is logged into our system by section, row and seat so we are easily able to keep track of those tickets through the time of use for that particular event. Veteran Tickets Foundation continually monitors secondary ticket websites and classified ads to ensure donated tickets are not sold. Major donors also monitor events and open ticket markets for the sale of donated tickets. If a member is identified as selling a ticket that was donated to them by the Foundation, that Veteran will be flagged and their privilege to request tickets to all future events will be rescinded. NO excuse will be considered! Members may only request tickets for one event per day. The system will not allow same day request when member currently has a request on that day. If no tickets were awarded for previous request, then those request can be deleted so that a new request on that day can be made. Members shall contact only VetTix.org Support by going to the website and clicking support when you have questions about your tickets, you may NOT contact the teams, venues, organizations, sales offices, will call windows or anyone else associated with the event. This is listed in the terms you agree to every 60 days, listed on the event page itself in more detail and also listed in the email you get when you get tickets. Spam Reporting Policy. In all of our communications we provide an unsubscribe link. When creating your account you get to choose if you want regular communications from us or not, and you may adjust your communications preferences at any time by visiting the My Notifications page after you log in. If you decide not to adjust your own settings or you decide not to click the unsubscribe link when you no longer want communications from VetTix, but decide to click your email providers spam button, you then put other Veterans at risk of not receiving important communications from Vet Tix because of your actions. Marking us as spam will result in your account being suspended. If your actions were by mistake, and if this is a first time offense you may contact support to have your account turned back on. If you reported us as spam more than one time, over any time period you account will be suspended for a minimum of 90 days, at the end of 90 days you may contact support to request your account be turned back on. Disclaimers. Veteran Tickets Foundation does not promise that the Site will be error-free, uninterrupted, nor that it will provide specific results from use of the Site or any Content, search or link on it. The Site and its Content are delivered on an "as-is" and "as-available" basis. Veteran Tickets Foundation cannot ensure that files you download from the Site will be free of viruses or contamination or destructive features. Veteran Tickets Foundation disclaims all warranties, express or implied, including also any implied warranties of merchantability and fitness for a particular purpose. Veteran Tickets Foundation will not be liable for any damages of any kind arising from the use of this Site, including without limitation, direct, indirect, incidental, punitive and consequential damages. Veteran Tickets Foundation makes no guarantee of any specific result from use of this Site or use of the Veteran Tickets Foundation service. Limitation on Liability. 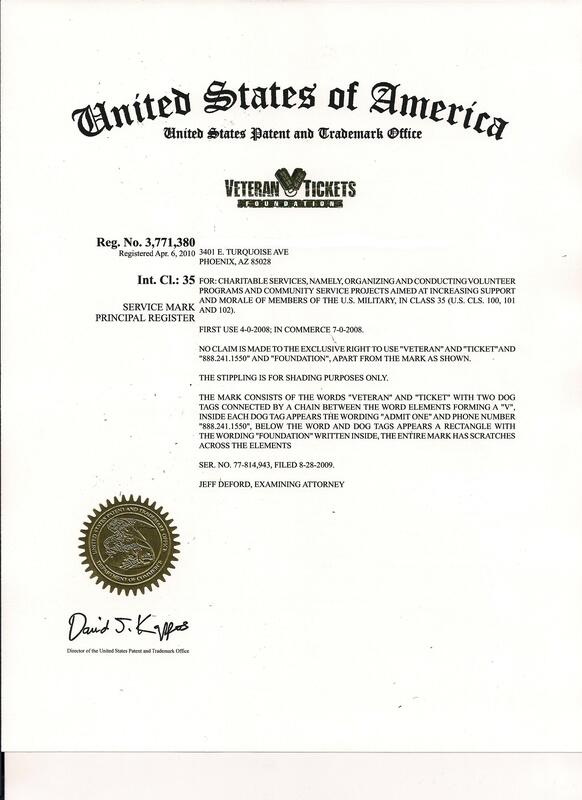 Except in jurisdictions where such provisions are restricted, in no event will Veteran Tickets Foundation be liable to you for any indirect, consequential, exemplary, incidental, special or punitive damages, including lost profits, even if Veteran Tickets Foundation has been advised of the possibility of such damages. Disputes. If there is any dispute about or involving the Site, by using the Site, you agree that the dispute will be governed by the laws of the State of Arizona without regard to its conflict of law provisions. You agree to personal jurisdiction by venue in the state and federal courts of the State of Arizona, City of Phoenix. Indemnity. You agree to indemnify and hold Veteran Tickets Foundation, its subsidiaries, affiliates, officers, agents and other partners and employees, harmless from any loss, liability, claim or demand, including reasonable attorneys' fees, made by any third party due to or arising out of your use of the Site, including also your use of the Site to provide a link to another site or to upload content or other information to the Site.